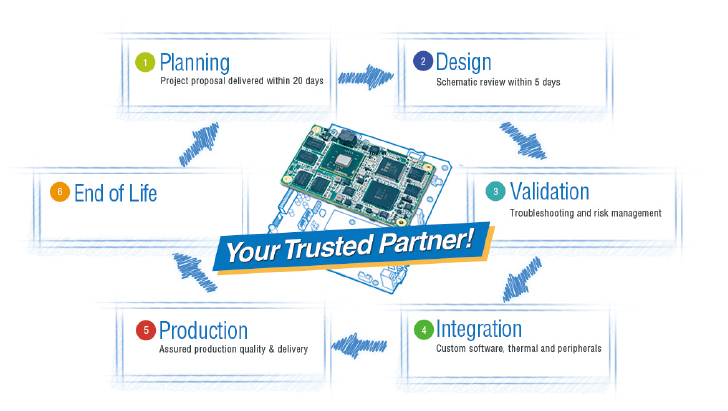 Advantech COM Design-in Services covers all your questions from the design-in process and volume production, to product lifecycle management. We act as your in-house engineer as well as your personal consultant. Customers beneﬁt from easy selection of modules, accessories and software, all backed up by our expert-integrated team. We transform complex COM development into easy tasks so our customers can better meet new market challenges. COM Design-in Service 1.0 is focused on timely response to customers’ issues. Now the new Service 2.0 offers proactive services with pre-valid technology to ensure project success and time-to-market.